Preci-Tip™ Precision Dispensing Tips or Nozzles are designed for accurate dispensing of dots, beads or in-fills. Their streamline conical fluid path delivers considerably higher fluid flow rates and lower dispense pump back pressures than most standard dispensing tips. 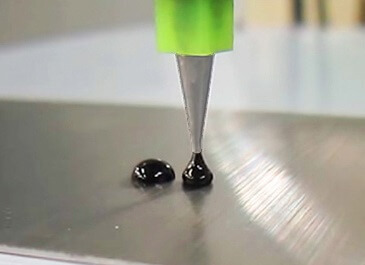 This results in improved dispensing accuracy and component life. 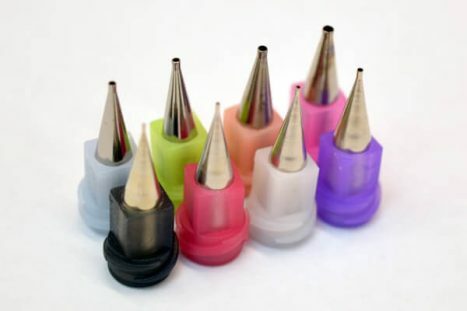 The thin wall nozzle cores are produced using a deep drawing process, giving particularly low resistance to fluid flow, and exceptional accuracy and robustness compared to plastic dispensing tips or nozzles. They have an industry standard Luer Lock thread and can be used with common dispensing barrels or valves. 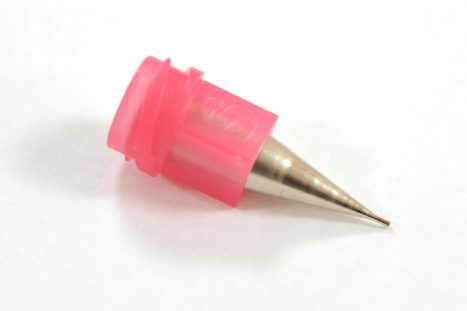 Preci-Tip Precision Dispensing Tips feature walls which are very thin and rigid, resulting in a smaller outer diameter (OD) required for large inner diameter (ID) fluid paths. 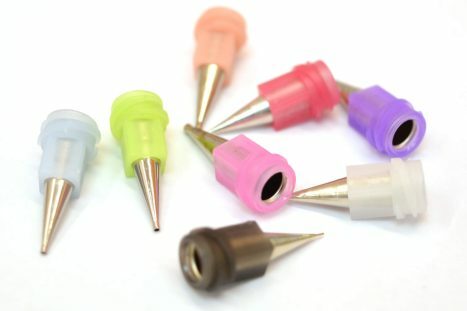 This can be particularly useful where a small gauge tip is needed, without compromising on fluid dispense rates. The thin walls further enhance the accuracy and definition of dots, lines or special patterns, and dramatically reduce fluid stringing or tailing tendencies. 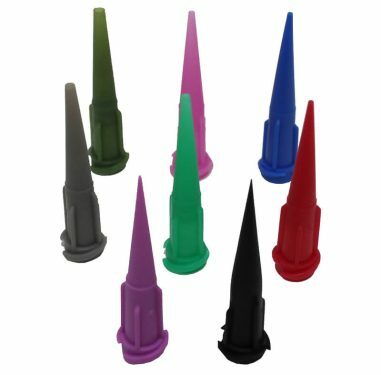 Preci-Tip Precision Dispensing Tips standard gauge tips are made from phosphor bronze with electroless nickel coating. This provides a hard, abrasion resistant nozzle with low resistance to fluid flow. As an option, Preci-Tips are available with a nickel PTFE coating – an electroless nickel coating with polytetrafluoroethylene particles. This provides a hard, abrasion resistant, inert, lubricious and hydrophobic surface which provides even better release of liquids and oils. 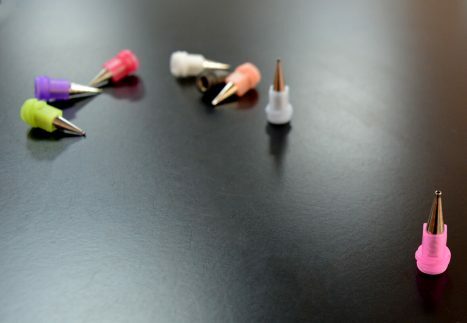 Micro-gauge Preci-Tips are made from nickel silver. All Preci-Tips have polypropylene hubs. 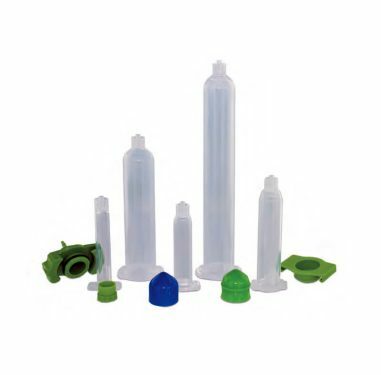 QuantX Dispensing Components are our premium range of syringe barrels, pistons and accessories. 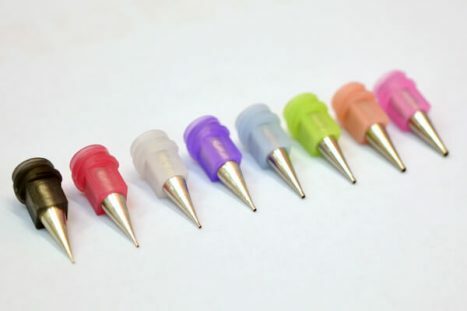 These dispensing consumables are manufactured to strict standards to ensure a high quality product and interchangeability with other premium brands. Next day delivery available. 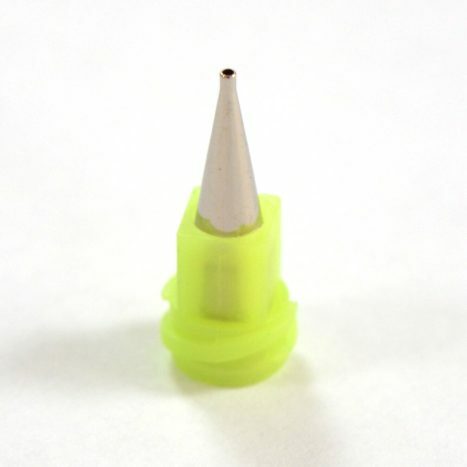 Smooth flow tapered tips are useful for medium to high viscosity or filled materials like solder paste or conductive adhesives. The preeflow eco-PEN is a precision volumetric, positive displacement, dosing/dispensing system that gives you accuracy and repeatability by means of a rotor which turns inside a stator. 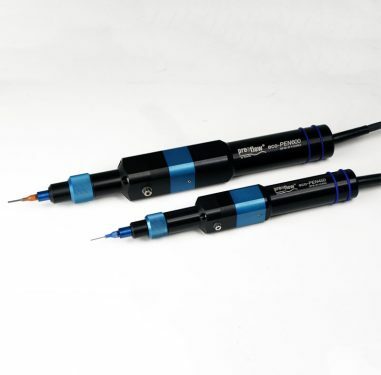 The preeflow eco-PEN uses a progressive cavity pump principle which doses and dispenses a wide range of material viscosities with no stress to the material, and absolute control.